Chicken, a member of the poultry family that includes turkey, duckling and goose, is one of Britain’s most bought meat products with an estimated 2.2 million birds eaten every day! That’s nearly half of all the meat consumed in the UK according to The British Poultry Council. So, once known as a predominantly red meat eating country, chicken looks set to have become the nation’s firm favourite for sandwiches, salads, starters and main meals. In a medium sized bowl, mix the honey and mustard together. Add the chicken drumsticks and swish the honey mustard mixture about so that the entire drumsticks are coated in the googey goodness. Set aside in the fridge to allow the marinade to work its magic into the chicken, preferably overnight if time permits. Grease a 2 litres ovenproof dish and place the prepared chicken drumsticks in it, cover with either foil or the dish’s lid if it has one and put in a pre-heated oven at gas mark 4, 180°C electric. Cook for about 45-50 minutes until the meat is tender. Take the dish from the oven and remove the foil or lid, putting the uncovered dish back into the oven and cook until the chicken drumsticks’ skins become golden and caramelised in appearance. Dawn: You can check the drumsticks are cooked by sticking a fork into the meatiest, thickest part of one or two and if the juices run clear, then they are cooked. Once cooked, serve either warm or cold with salad, potato wedges from the “How to Make Potato Wedges” recipe, coleslaw in “How to Make Coleslaw” recipe or a side dish of your choice. For more recipes from the Cooking Dynamo, follow @Love_Food_UK on Twitter and follow this blog www.forfoodlovers.wordpress.com. You’ll also find us on Mumsnet Bloggers Network and Foodies100…oh, and did I mention Facebook at www.facebook.com/lovefood.forfoodlovers? See you there for more fab recipes and food chat! 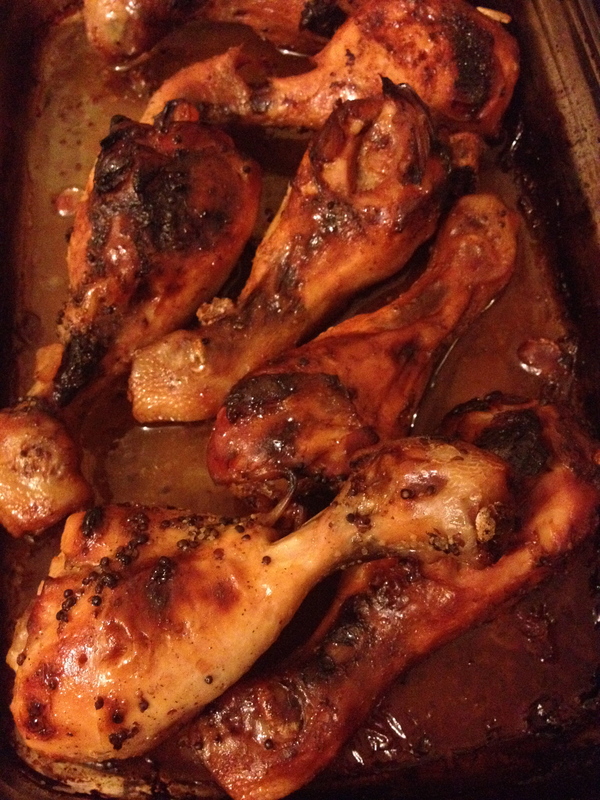 Posted on October 6, 2014 by Love Food UK	• This entry was posted in Dinner, Food, Great British Grub, Home Baking, Home Cooking, Lunch, Picnic Food, Quick easy meals, Supper and tagged chicken drumsticks, chicken drumsticks in honey and mustard, easy to follow recipes, easy to make food, Home Cooking. Bookmark the permalink.